Baba Ramdev’s Patanjali Ayurved is launching products in almost every category in the market and due to its “swadeshi” and “ayurved” tag the products are quite popular among the masses. The other reason for Patanjali product’s popularity is their easy availability even in remote areas due to the presence of divya pharmacy stores. 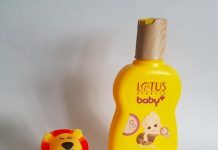 You can also buy their products online at popular e-stores like Flipkart, Amazon, First Cry (baby products), and its official website patanjaliayurved.net. 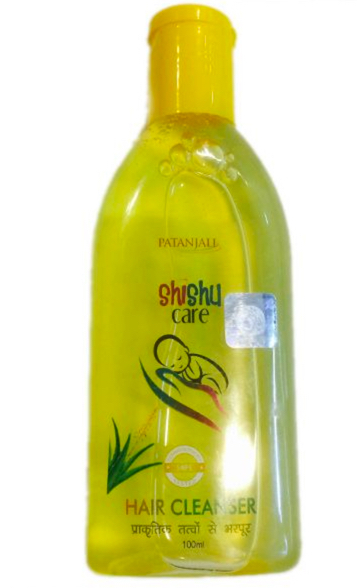 Patanjali Shishu Care is one such category which includes, as its name suggests, daily care products for babies. Like all other categories, the products in this category are also increasing with time and at the moment it has 7 baby care products. Its key competitor in this category is the another “herbal” product company “Himalaya“. A unique blend of Cucumber, Turmeric, Aloevera, & Natural oils that moisturizes baby’s delicate skin leaving it soft & supple. Rejuvenates the skin with its nourishing effect. Reduces dryness from the skin of the baby. Base Material: Mild lotion base, Vit. E, EH glycerine & phenoxyethanol, Sugandhit Dravya, water – Q.S. Usage: Rejuvenates the skin, reduce dryness, roughness & improves skin glow. Direction for use: Apply gently on baby’s face and body. Avoid the area around eyes. It is a gentle & mild, soap-free, gel-based body wash with natural extracts of neem, tulsi, turmeric, aloe vera, honey, glycerine and olive oil. It does contain few chemicals as a base. 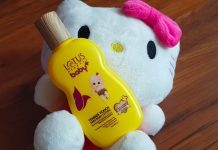 It cleanses gently and moisturizes baby’s delicate skin, leaving it soft & supple. 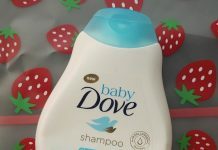 It is a top to toe body wash, that is can be used to wash baby’s hair and face too. Directions for use: Wet your baby’s body & apply the gel generously, lather and rinse with water. Avoid areas around eyes. Its shelf life is 2 years. A rare blend of Aloe vera juice & Rose water combined with shea butter & natural oils which moisturize baby’s delicate skin leaving it soft & supple. Useful in removing dryness & roughness of skin. Provides nourishment and moisture to baby’s delicate skin. A special light oil formulation with Olive oil as a base; enriched with Vitamin E, Almond oil, Sunflower oil, mustard oil and Coconut oil for natural nourishment, miniaturization and gentle care of baby’s delicate Hair. Useful in Rejuvenating, Nourishing and glowing of Baby’s Hair. 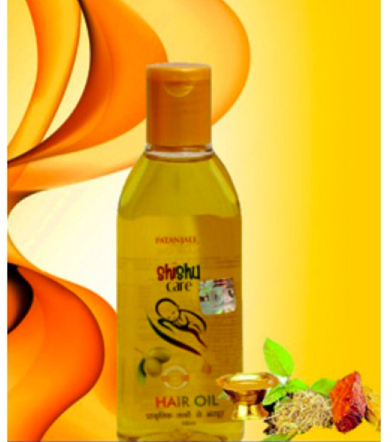 Almond Oil, Sunflower Oil, Mustard Oil and Coconut Oil for natural nourishment of Baby’s Hair. Nourishes the scalp of babies with its revitalizing effect. Base Material – Olive Oil, Vit. E, BHT, Sugandhit Dravya – Q.S. A special light oil formulation with Olive oil as a base; enriched with Vitamin E, Almond oil, Sunflower oil, Mustard oil, Jojoba oil & Gau ghrita for natural nourishment and gentle care of baby’s delicate skin. Useful in Rejuvenating, Nourishing & glowing of Baby’s Delicate Skin. 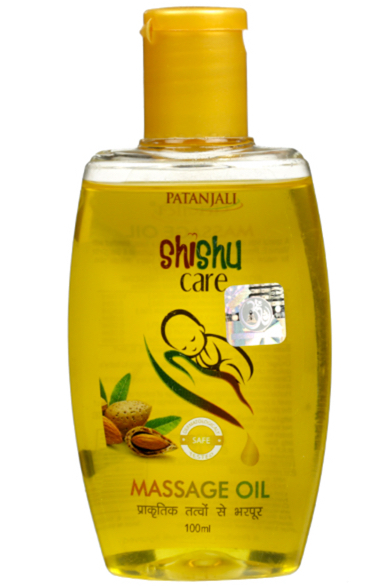 Shishu Massage oil is a light formulation with olive oil as a base; enriched with vitamin E, Almond Oil, Sunflower Oil, Mustard Oil, Jojoba Oil and Gau Ghrita for the natural nourishment of Baby’s Skin.It can be used as a regular Massage oil for Infants and babies. Usage: Useful in rejuvenating, nourishing, glorifying to baby’s delicate skin. Direction for use: Massage gently on baby’s body. Avoid the area around eyes. Patanjali Shishu Care Diaper Rash Cream Usage: Useful in dryness & roughness of skin & also helps to treat rashes & irritation caused due to rubbing of diaper over baby’s delicate skin. Base material: Mild cream base, sheabutter, EH glycerin & Phenoxyethanol, sugandhit dravya, water Q.S. Usage: Useful in rejuvenating, nourishing & glowing of baby’s hair. Direction to use: Massage gently on baby’s hair. Avoid the area around eyes.